Hello, dear readers. I'm hosting my first blog giveaway! Even if you're not excited, I sure am! This book giveaway came about in a rather accidental fashion. I purchased a copy of Will Write For Food by Dianne Jacob from online bookstore Fishpond awhile ago and after several weeks waiting for it to arrive, both the Fishpond customer service staff and I were convinced it was lost in the mail, so we organised for a replacement copy. It turned out that the first order was just severely held up, so I ended up receiving TWO copies of Will Write For Food. Rather than sending the extra copy back to Fishpond, I asked them for permission to give it away on my blog instead, and they gave me their blessings. So here we are. 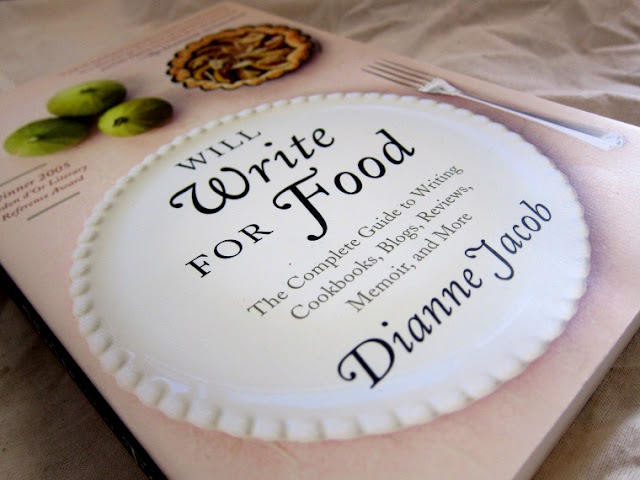 Will Write For Food, a book on food writing authored by Dianne Jacob. Alright, I know there are many of you out there who love food... and writing about food. You will probably want to have a copy of this book... so let me tell you more about it. If you have a strong interest in food writing, you may already be familiar with Dianne Jacob's blog. I discovered it earlier this year and have been a regular reader since. I find it to be constantly challenging, interesting and helpful, factors that spurred me on to my eventual purchase of Will Write For Food. 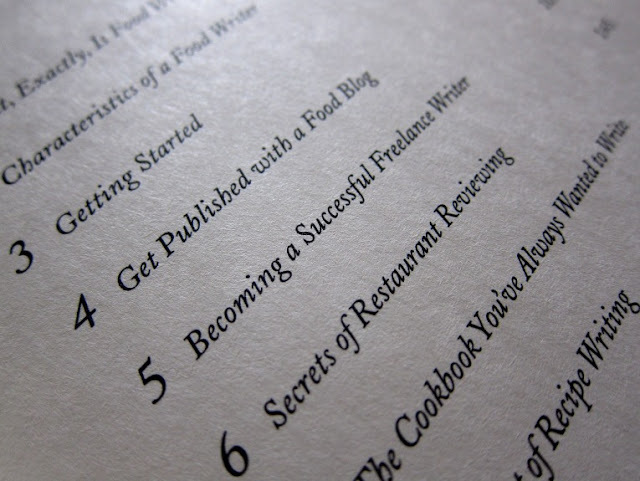 The chapters in the book cover blogging, freelancing, restaurant reviewing, cookbook and recipe writing, fiction and non-fiction writing, and getting published. I am only about halfway through at the moment, so I can't give a complete review of it, but I'll tell you this: Dianne gives me the realisation that my writing can be so much better, and tells me what I can do to achieve my potential. The examples in the book are illuminating, the advice insightful and the writing exercises practical. For more in-depth and technical information on a particular food writing niche, you'll want supplementary resources (and Dianne provides helpful lists of reference books for this purpose, too), but this is a great overview and starting point. I'm glad I bought the book, and even though I'm yet to finish reading it, I can already see myself returning to it again and again to improve and revitalise my food writing. 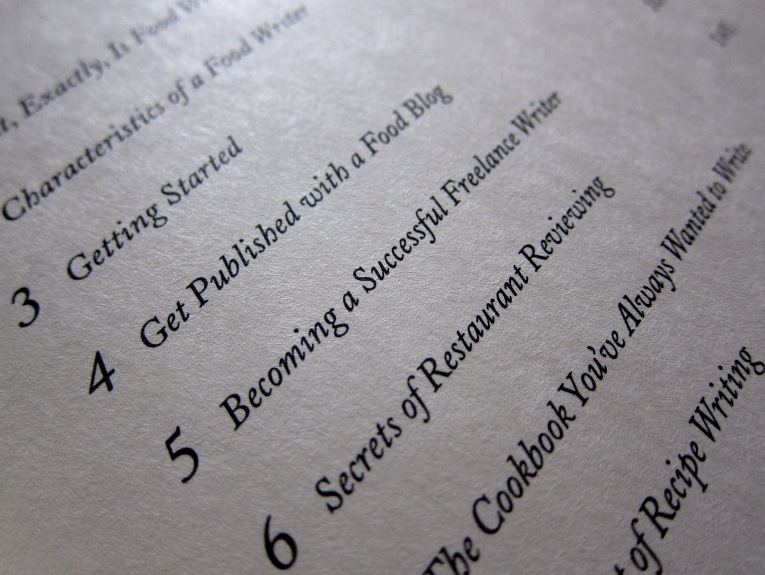 A snapshot of the chapters inside Will Write For Food. Now we get to the fun part... your chance to win your own copy of Will Write For Food! This giveaway is open to anyone who loves writing about food, regardless of where you are in the world, so to be in the running, just leave a comment telling me about your food writing aspirations. What are your goals and what are you doing (other than entering this giveaway!) to reach them? I'm sure there will be some really great answers, so I'll pick a handful of favourites and draw a winner out of those shortlisted. Please ensure that there is some way I can reach you (e-mail address, twitter account, blog URL etc) if you win. The deadline is the 26th of October - I'll be going by the time stamp on this blog, which is based in Melbourne, Australia - and the winner will be announced shortly afterwards. P.S. Besides Fishpond, you can also purchase this book at The Book Depository and Amazon. P.P.S. For those who are not aware, I now have a Twitter account, and even more recently, a Facebook page! It's not compulsory for entering the giveaway, but if you would like to follow me on either, or both avenues, that would make me quite a happy girl. My passion is to reach out to people everywhere through Food Blogging with my writing and photos. I would like to appeal to the average person, from an average person's point of view. Though I don't have any professional knowledge and experience on Food, but I believe this what makes my point of views more personal and easy-to-relate. I prefer to adopt a more honest, light-hearted and friendly approach in my form of writing. As far as I'm concerned, Food is always meant to be Fun and never to be taken too seriously. At the end of the day, I truly I hope I can show people that Food really is more meaningful when it is shared and that they, too, will feel inspired to open up spaces to share Life* with other people over Food, whether at home or at a restaurant. It is for this reason that Food Blogging, to me, is more than just a hobby, but a passion. I have begun food blogging again about a month ago and I believe that's a start. I have been dedicating time out of my week to share recipes and reviews and can only hope that people find it just as Fun to read as it was for me to write. At the same time, I feel very strongly about showing the same support and encouragements that I have been so blessed to receive during my short time of blogging to as many people out there, both in and out of the food blogging community. These people have truly made this whole experience so enjoyable for me and has reaffirmed me of the reasons I do the things that I do on my blog. My plan is to keep blogging for a very, very long time. Why stop now, right? It's been great so far and I'm sure it'll only keep getting better. It is a journey and I hope to find growth in my writing and pictures continuously over time. Thank you so much for your comment, Winston. I'm glad you started food blogging again - you add so much warmth to the community. And I agree - the more you blog, the better you get! My love of food writing comes from my love of synesthesia. Flavors and colors and memories and scents overlap in the brain and what I want to do with my writing is to get really, really precise with words about exactly what is the flavor of a great pear, or why caraway will always remind me of my childhood. I write a food blog over at http://www.kitchenshaman.com/blog. I aspire to write about culinary techniques applied to vegan cooking, food history and knowledge, and tips and tricks. I fell into this kind of by accident, and read Dianne's book last year to help hone my ideas. Since then the blog, and the fans have grown. I love to write, it was my passion when I was younger. I just need to find motivations to write every day. I've taken on the challenge of Vegan Mofo. Write everyday for the month of October. Whew...lots of words. Lots of fun. I own this book too. :) It's a really good book so anyone who got this should feel lucky! Thanks Elizabeth. I do believe food writing can really be enhanced with elements of synesthesia. Thanks Kitchen Shaman, good to know Dianne's book has helped you too. Wow, writing everyday for a month is quite a task. That's great! I've been working on this by obviously, blogging fairly vigorously, reading lots of other food blogs and other sources, looking for inspiration and other ways of writing and presenting my stories and ideas. I recently finished Heston's 'Perfection' books, which I felt were a fantastic as I loved his nostalgic and very personal style of writing, which I feel is something I want to inject more into my blog. I write about food, in short, because its what I love. Growing up for the most part I didn't have alot of experience with food until I moved out by myself at 17.I write about food as its a portal into myself, its an easier way to show people who I am and what I love. I write on my blog Polkadots & Chopsticks in between working my desk job 5 days a week. I know I can be better but I'm starting with baby steps for now :) I have many goals for my future - travel, learn new things, cook amazing dishes - and one day have a job in the food industry that I love doing every day. Hi leaf, congratulations and this is something I can look forward too also. We love writing about food since we love cooking with fresh ingredients and entertaining at home. We started our blog because we wanted to document our gastronomic journey and be able to share it with friends. Our food aspirations are simple and we have stated this philosophy on our blog to guide our writing endeavours - to share food and life moments with friends that make life worth living. Best to you. Thanks Diane! I look forward to the launch of your blog. Gluten-free baking is challenging but it feels so good when you get it right! Ashley, it's great that you have pin-pointed specific areas you want to work on and that you are taking the time to learn from varied sources, that's something I'm trying to do too. I always enjoy reading your restaurant reviews. And it really is nice to see how much we improve as we continue with our efforts! Apple, I am much the same - while I would occasionally prepare meals with my family in Malaysia, I didn't really do any substantial cooking until I came to Australia for my studies, also at age 17. I too try to fit my blog amongst my job and other activities, and I look forward to a more rewarding career change as well. My main goal when we started our blog 5 years ago was to provide a vegetarians' guide to Melbourne - after all, Melbourne's 'best' restaurants and cafes are not necessarily the restaurants and cafes that offer the best vegetarian food. The internet had led us to some awesome veg eating on a holiday and I thought we could try playing tour guide in this city. Something we've worked hard on to this end is the navigation of our site. This starts with addresses and websites, of course, but extends to indexes that we update every time we post and a google map linking to all our reviews. (All mapping credit to Michael - he rocks!) It's no use having all that info there if no-one can find it! We've also started keeping an eye out on accessibility issues when we go out to help folks with wheelchairs, prams and/or mobility issues. There is now a huge community of veg*n (and other) bloggers and Melbourne and we tip our hats to them too. I think about half of our time blogging restaurants is now spent collating and linking to other people's accounts of the same place. It's great to build and share that more complex picture of multiple people's visits, experiences and personal tastes. If she is the same Dianne Jacobs with the fabulous chocolate cake recipe I remember from at least 25 years ago, then I would love that book! I have been blogging for over two years now, very seriously, and it has been very gratifying as I have been blessed with an increasing readership..I am planning to publish my own cookbook soon and hope to give a voice to a lot of people who do not get heard in their day-to-day life in Lebanon; my passion has always been cooking, especially Mediterranean food, but also writing about it; I have started a few months ago to publish articles online and would be so grateful to have this book in my possession to hone my skills. This book will be such a gift to those who enjoy food and writing about it :) and I'm sure I have lots to learn from this book. Thanks Cindy (and Michael)! As an omnivore who enjoys vegetarian food I visit your blog often and I'm sure your detailed information and plentiful links have something to do with it. You're definitely performing a great service! tasteofbeirut - I'm not sure that is the same person, but do check out this Dianne! I've linked to her blog in my post. If you're writing articles and planning on publishing a cookbook, I'm sure you'll find her site and her book very helpful, as it has been for me. Hope things go well for you, I would love to read more about Lebanese food and culture. My main aspiration is to be editor of Vogue entertaining, but I have no strategy for getting to that position. I have never heard of this book, sounds very helpful. I love to cook and started my blog initially for recording all the different recipes I had been trying. But since then have fallen in love with the world of blogging and would really love to express myself through my posts using beautiful photos and words that truly celebrate the food. Foodycat, that would be such a great gig! I imagine you just need to build up experience writing and editing for smaller publications first and see how it goes from there. Muppy, I too have come to enjoy the art of blogging. It really is a growing process! I am an aspiring food writer who started a food blog (http://dfordelicious.com) to hone my food writing skills, share our eat-out adventures and cooking misadventures (I am just a beginner cook) as I begin a new chapter of my life as a housewife (which I hope is not permanent) in Dubai. I was a media planner by profession, who writes emails, reports, presentations day in a day out. So guess how challenging it is for me to shift from politically safe, repetitive, business-y writing to more creative and indulgent food writing? Also being transplanted from my life in the Philippines to the land of middle eastern extravagance that is Dubai, I am struggling to find my creative identity and writer's voice. My life's quite shaken from the move; though I am happy to be together with my husband, whom I have had a 3-year long distance relationship with. Sigh. I'd really love a copy of this latest edition of the book to guide and to further inspire me in my journey to becoming a true blue food writer. I have been trawling through Dianne Jacob's archives ever since I came across her blog last year. I love it. I always feel a bit weird being a food blogger and entering giveaways on food blogs, but here goes. I started blogging a year ago when I became seriously ill with totally random symptoms - mind-numbing headaches, blurred vision, back pain, dizziness, vertigo. I couldn't attend uni and spent weeks in bed before my fabulous doctor diagnosed a b12 deficiency. It sounds cheesy and it sounds overly dramatic but since I didn't know what was wrong with me and could barely get out of bed, I vowed I'd make something of this knack with words people often accuse me of. I had been reading blogs (mostly food blogs) for years. I set myself the task of writing about food because I knew I'd eat, simple as that. And one year later it has brought me more rewards than I ever could have hoped. My goal is to make my blog as much of an inspiration as the blogs I love and am inspired by. If one person is as inspired by my blog as I am by Homesick Texan, The Stone Soup or He Needs Food, then I consider my goal complete. I am also working on a project to give something back to the community, The $35 Challenge, which aims to raise awareness of and money for Australians in poverty. What an excellent idea! I already have this book and it an excellent resource for writers - we can all learn something and Dianne is very generous with her knowledge. Hi Didi, it really sounds like you're out of your comfort zone at the moment, but you know what they say... with change comes opportunity! I have no doubt you will find plenty of inspiration in your new adventures. Hi Lau, thank you for sharing your story. It's awesome that you turned a negative into a positive during those darker days - and great to know it has been so rewarding for you. I like the sound of the project you're working on - I'll have to check it out. Thanks Amanda! I agree. I'm still finding my way in the world of food writing and I am happy I have this book to guide me as I explore my possibilities. Food is what completes our eclectic family of artists. Some write, some draw, some sing - but what unites us all is our love of cooking. Strong on family history, we have begun writing a book about our culinary experiences. Intertwined with special occasions (there was an incredible French-Italian birthday/thanksgiving that will never be forgotten! ), the cooking experience extends beyond the kitchen. There are book readings, themed dining rooms, presents and more importantly, memories. As the eldest sibling, who was a late bloomer in the kitchen - I am often in charge when it all goes pear shaped minutes before the big reveal. Recipes are for inspiration but loosely followed. It is an adventure in cooking and writing that brings the whole family home. The kitchen really is the heart and soul of our home. I very recently started a food blog of my own.I really want to be able to write in a way to really connect to people who read my blog, and hopefully, teach them something as well. I have a lot to learn, and a long way to go. This book sound like a great way to learn. This is an amazing giveaway! Lots of stuff to learn from Diana. Off to check her blog. There must be such a beautiful atmosphere in your family get-togethers, Melanie! Your book, when finished, should be quite a treasure. Emily, that's what I'm striving to do, too. And the book is indeed a great guide. My food writing aspiration is to be able to write about vegan cooking in a way that helps non-vegans and vegans alike eat great meals that are healthy yet sinfully delicious. My goal is to be able to show people that they can release weight and keep it off just by eating in a way that works best for their bodies and still getting amazing food. I have just started a blog/website. The progress of it is slow because I am teaching myself along the way on how to design it and create interesting content. I need all the help I can get, for i don't feel all that confident. Thank you for the opportunity to learn and grow. Thanks Katherine! How fantastic that you now have a career in food writing. I hope to achieve something like that one day. I can stay out of the giveawat since I already own it, just want to say that it's a great book, I read it in three days, couldn't stop! It is really helpful and insightful, and a great help to get started! I bought this book on Amazon when I was in the early stages of planning my blog. I love this book and refer to it all the time! I fell in to writing this blog after a three month holiday which saw our family drive from Coffs Harbour to the tip of Cape York. I blogged the whole holiday (on a different website) and loved every minute of journalling the event. I noticed whilst writing the updates that even though we were writing for the caravan and motorhome group, all my posts were about food and boutique stories etc. Cute little getaways spots etc. When we came home I missed communicating daily with the world, so I started to think about what I would really like to write about. I couldn't go on a permanent holiday but we always take mini breaks, Gourmet Getaways was born. Gourmet Getaways has evolved into a means of luring and inviting people to experience more of life. I love food so I am always looking for great producers, restaurants or something quirky to share with readers. I particularly like to highlight the area between Port Stephens and Byron Bay as there are so many idyllic getaways, on the beach and in the hinterland. I get so much out of writing my blog, I really enjoy being a voice for the area I love, and that is probably one of my main motivation. I also love sharing recipes. It almost feels like entertaining more friends at a dinner party when I put a dish up and have so many wonderful people comment. The sense of community is just wonderful in the blogging world. my aspirations.... & my giveaway winner!